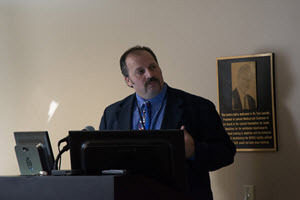 An engaging and intellectual crowd gathered to hear speakers discuss Simulation Now and into the Future on the morning of Friday, May 22nd, 2015 for the 13th Annual Safar Symposium. The WISER portion of the symposium was held in Oakland and also broadcasted live. This year�s symposium featured lectures from subject matter experts about state-of the-art simulation programs. 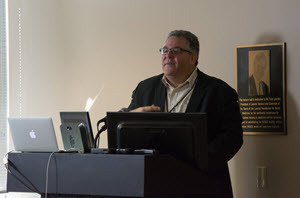 The experts covered topics about the use of virtual environments and how they are transforming learning in the clinical and classroom setting, the use of simulation in real environments, and how current certification and testing methodologies are affecting the outcome of a student�s learning experience. Following each lecture, the floor was opened to the audience for questions or thoughts about the future of simulation education. "The Promise of Virtual Environments and Serious Games in Healthcare"
"Game Mechanics, Game-Based Learning, and Simulation: Developing Translational and Transformative Clinical Education"
"In-situ Simulation and Resuscitation: Where Plastic Meets Practice"
"Simulation in the Maintenance of Certification in Anesthesiology (MOCA) Process"
"Integrated Progress Testing Through Blended Simulation to Assess Clinical Readiness in a PharmD Curriculum"
The morning concluded with closing remarks by WISER Director, Dr. Paul Phrampus and the Director of the Safar Center for Resuscitation Research, Dr. Patrick Kockanek. On behalf of the Dr. Phrampus, Dr. Kockanek and the rest of the Safar Center and WISER staff we would like to thanks the speakers and the guests for making this another successful Safar Symposium. "I made use of the opportunities that life offered to do some good."